Bartlett Fire Protection District Fire Chief Mike Falese is retiring in June following nine years as chief, nearly 12 with the district, and 38 in the fire service altogether. 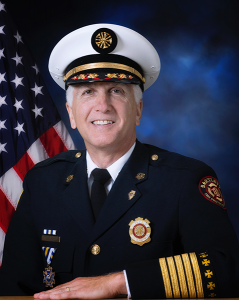 Falese was named Fire Chief of the Year by the Illinois Fire Chiefs Association in 2014. During his time in Bartlett, he served as a director of that association in 2010, vice president in 2011, and president in 2012. He also serves on the DuPage and Kane County Fire Chiefs Associations. Among the other responsibilities Falese has taken on in the community are his service on the Elgin Area School District U-46 safety committee and the board of advisers for the department of public administration at Northern Illinois University. Falese also is past president of Bartlett Rotary Club and is a two-time Rotarian of the Year. He currently serves on the nonprofit Ignite the Courage to help people in need. After 33 years and eight months working for the Berwyn Fire Department – the past 11 years as chief – 58-year-old Denis O’Halloran’s last day on duty was April 2. 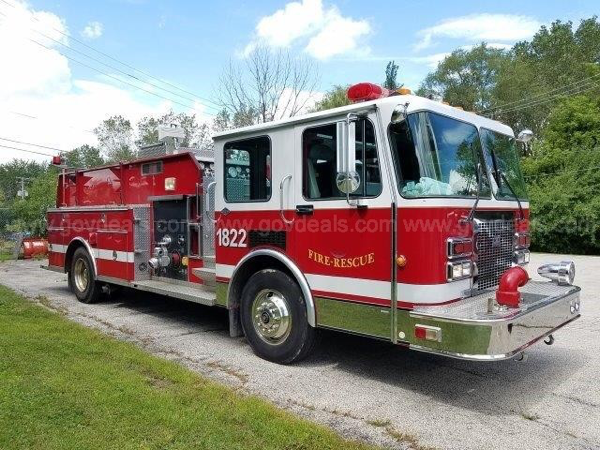 After a few years as an EMT, he became a Berwyn firefighter in August 1985. He was later promoted to lieutenant and then to deputy chief/shift commander. After nine years in that role, he was named fire chief in March 2008. O’Halloran has seen the number of calls nearly double from 4,000 to 5,000 a year to around 8,000. Most of those are medical. About 250 are structure fires each year. The department is more involved in the community under the leadership of O’Halloran, who made sure firefighters attended block parties and read to students at schools. Before he became chief, he started a Citizens Fire Academy, which teaches residents about the training firefighters go through, from setting splints to climbing fire ladders to using the jaws of life in a staged car accident. It meets each autumn. Many memories will stay with him forever. In 1976, while in high school, he skipped church to watch the impressive fire at the Berwyn Lumber Yard. The biggest fire he worked was the one at the World’s Largest Laundromat on Cermak Road. Other memorable fires were at a RE/MAX office and the Seneca Restaurant, both on Cermak. He and other Berwyn firefighters went to New Orleans to help with the cleanup after Hurricane Katrina. O’Halloran is glad his career was spent working in his hometown. In 1974, he graduated from St. Leonard Grammar School. In 1978, he graduated from Morton West High School, where he played football. He attended the 40th reunion on crutches in September after his softball injury. The fire department has a new chief. Thomas A. Hayes’ first day was April 3. Kris Coniglio is the department’s new assistant chief. 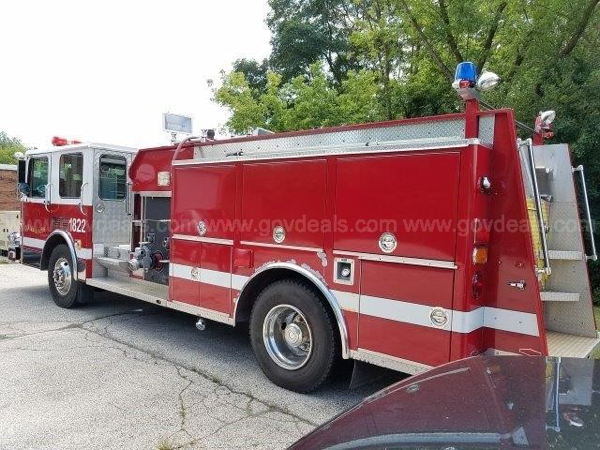 1992 Spartan Gladiator PE-1536 tilt cab, seats 4. Truck and equipment are in good working condition with no known issues at this time. 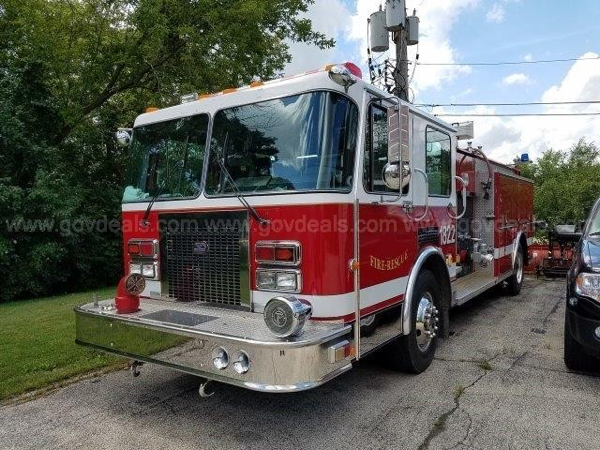 Truck has been reserve engine for the last 12 years and has been out of service for the last 6 months. All city identification decals will be removed. All lighting will remain in tact and functional. Truck chassis has 75581 miles and 8746 hours. Cummins C 8.3 and Allison automatic. Hale 1500 G.P.M single stage pump with 447 hours. 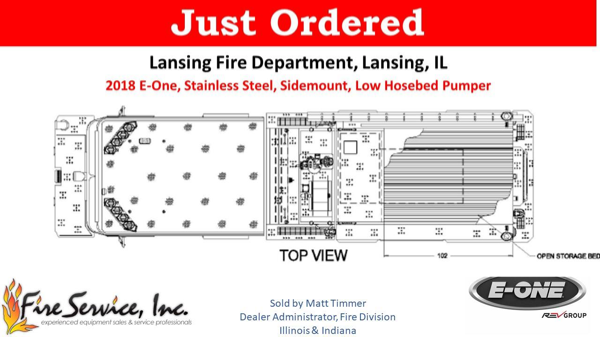 Steel 750 gallon tank. Two 2 1/2″ discharges on left side. One 2 1/2″ and one 4″ discharge on right side. Two 2 1/2″ discharges at rear. Two 1 3/4″ cross lays. 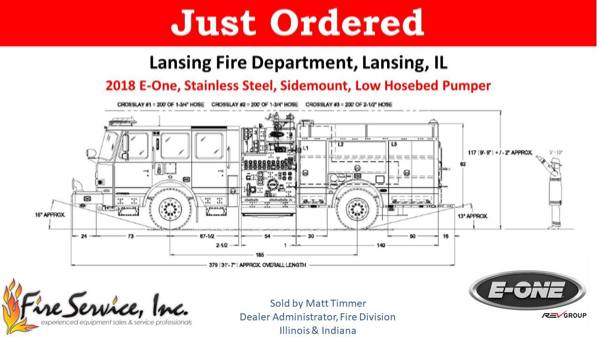 Piped deck gun. 5″ front suction. One 2 1/2″ aux suction on both left and right side. Booster reel on top left. Inspection available at fire station 2 on Tuesday-Thursday between 7 am and 12 pm by appointment only. 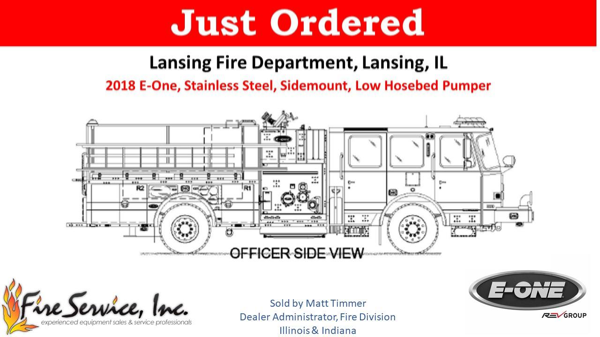 Congratulations and a Big Thank You to Chief Chad Kooyenga, Lt. Keith Zigterman, and Committee Members, on the purchase of their new 2019 E-One, Stainless Steel, Low Hosebed Pumper. 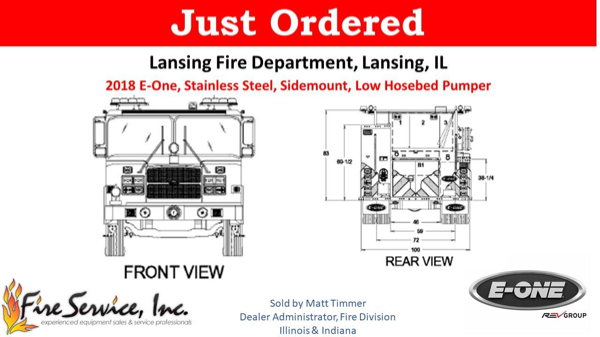 This is the first unit purchased from Fire Service, Inc. We Thank You for your business and look forward to continuing our relationship.